06 Jan 2016 in Food ~ read. by the name of Duncan MacDougall decided, at the very start of the 20th century, to perform a then-serious, now-hilarious experiment. He tried to prove, empirically, that souls exist. His discovery? The bodies lost weight after they died - an average of 21 grams. The weight of a human soul. is a restaurant in Chicago which has my favorite name of any restaurant I've ever visited. As you've probably deduced, it's run by two individuals. This wouldn't be particularly remarkable if it were a hole-in-the-wall, taco stand, or food truck, but these two are serving up a multi-course tasting menu by themselves basically five nights a week. 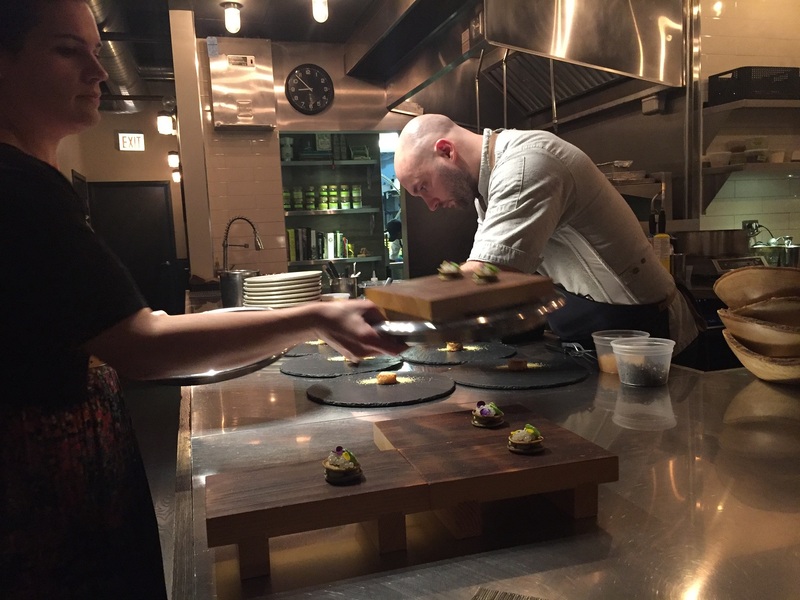 Most restaurants that serve tasting menus have a whole team of cooks in the kitchen at various stations, with the chef at the helm dictating who's doing what at what time. Called the brigade (bree-GOD), this process is essentially the kitchen's version of the assembly line, its Henry Ford instead named Auguste Escoffier. It's a great, fun fact to drop at parties. Or not. I am not responsible for your being seen as pretentious. Pick two. It's best to illustrate this with a few examples. American Chinese restaurants tend to have hundreds of dishes on their menus. Many people love this because they believe the number of items on the menu correlates with the skill of the people in the kitchen. The more there is to choose from, the better the cooks must be, right? Nope. If you look at the items on the menu, virtually all of them use the same ingredients, but the dish on one row might use bok choy instead of broccoli, the dish on the next row might use pork instead of chicken. But they're each somehow classified as their own "dish." By using the same ingredients over and over, the cooks are able to pump out dish after dish with minimal effort. Success in this category depends on playing to a broad audience who ask questions like, "Do you feel like eating Chinese or Italian tonight?" The food truck. Successful trucks never have an extensive menu, but rather a few dishes they make exceptionally well. They just don't have the real estate to make more than those few dishes. Either they'd need to store more ingredients or implement different kinds of cooking appliances, neither of which is particularly feasible given their constraints; food trucks and hole-in-the-walls that try to do too much usually fail. Success in this category is achieved through the perfection of one or two dishes, with a few decent sides to satiate those whose palates don't like whatever's in the truck's star dishes. Haute cuisine; restaurants that aim for stars. I'm fascinated by this category the most because it tends to be where the most innovation occurs, and I'm always on the hunt for new and exciting things to try. One particularly fascinating note about the restaurants here is that they will often have more cooks in the back than diners in the front, and with good reason. To serve each individual diner numerous different courses prepared numerous different ways in a timely fashion, you need an efficient, skilled supply chain in the background. Success in this category implies a kickass experience in terms of atmosphere, service, and most importantly, food. Chef Jake Bickelhaupt and his wife Alexa Welsh - just the two of them - manage to put 42 Grams into this third category. A truly Herculean task, as you can see. We'll get to that later; by now you're probably tired of reading plain text. Just as it's the chef's job to ensure a meal is paced correctly, it's my job as a writer to keep you engaged throughout the course (ha) of my article. So. Without further ado... BON APPÉTIT! To be technical, the term caviar refers to sturgeon eggs. Other fish eggs, such as those of the salmon, are referred to as roe. As it turns out, snails lay eggs too, but what the hell do you call them? Is it even edible? Believe it or not, it takes a minor amount of literary energy to craft a menu. I think we can all agree that "snail eggs" sounds terrible. 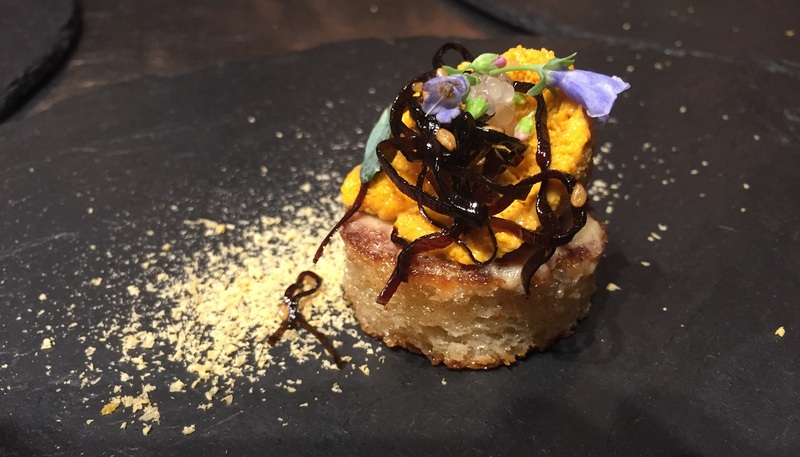 Only the most adventurous diners would consciously order a dish called "snail eggs." "Snail roe" also doesn't quite hit the mark. "Snail caviar," on the other hand, gives it the sound of luxury while still calling forth the fact that these are eggs. Snail also works better than escargot; escargot connotes the baked or broiled snail itself. Good editorializing, 42g! For the second question, yes, they are edible, and Bicklehaupt seems to be the first person to figure out how to make them work in a dish. 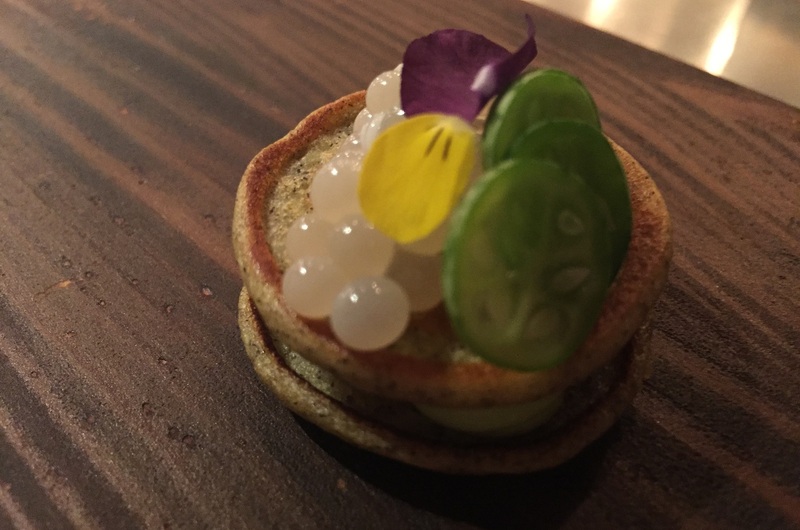 We have four miniature dollops of creamed avocado sandwiched between two miniature buckwheat pancakes, topped with snail eggs and three slices of crisp, refreshing cucamelon. The snail eggs, which look like larger, opaque salmon roe, are rich, creamy, and slightly slimy, not dissimilar to mucus from a runny nose. This worked exceptionally well (!) with the buckwheat, which dissolved into an earthy mush, almost like a cream in its own regard. Mixed with the avocado cream, which had a lighter, fluffier consistency and the hint of citrus, the whole (tiny) package was a complex, thoroughly enjoyable experiment in texture. Some of you more astute readers may recognize this as a play on the classical Russian blini with caviar and crème fraîche. Sometimes I take good photos. But only sometimes. Santa Barbara seems to be the place to get sea urchins these days. Curiously, online research tells me that some restaurants in Japan - a place with exceptional naval terroir - import them from Santa Barbara. I think 42g flies in fresh ones daily, and this vibrant orange uni - moist, sweet, buttery - was certainly superior to the one I had at Momotaro a couple days prior, which was significantly drier and tasted slightly metallic. Needless to say, the Japanese influence is clear. The sweet-smelling brioche, initially crunchy, then airy and chewy, is brushed with miso butter. Strands of kombu seaweed, a quintessential building block of umami flavor, add some visual contrast. Flakes of tamagoyaki (Japanese egg omelet) litter the slate, and finger lime vesicles (basically a fruit caviar) lie beneath the flowers. Some flowers are named based on how they look; others, how they taste. The baby blue oyster blossoms taste, indeed, saline and aquatic, bringing back dormant memories of long summer days spent shucking mollusks on the pier. Kidding, I've never done that (though it does seem nice). While this dish was the prettiest, it was also the least memorable. Think long enough about this seemingly divine preparation and you will realize its inherent brutality. The sturgeon, a magnificent fish which jets through the oceans like a missile through the air, sits cooked, smoked, and dead atop this fine ceramic plate, underneath half a tablespoon of its own unfertilized young Yes, imagine that. If it is your tradition to say grace before the meal, thank not some tenuous deity but the bounty of the sea, the fisherman who fetches it, the craftsmen of his seafaring vessel, the trade stands of the market, the appraising eye of the purchaser, and of course the cook who prepares it with such skill that it appears such before your eyes: beautiful, edible, delectable. The luscious Golden Osetra caviar was on point, its tiny olive-colored spheres separating smoothly on the tongue, bursting with their characteristic mild salinity when pressed, complementing the distinct mintiness of those tiny sprigs of dill. You cut a piece of the sturgeon, note its tenderness, and swirl it around it the milky Vichyssoise sauce before you pop it in your mouth. It's juicy and smoky and fishy and the sauce is mildly sweet, mildly creamy, mildly umami, and it's nice. 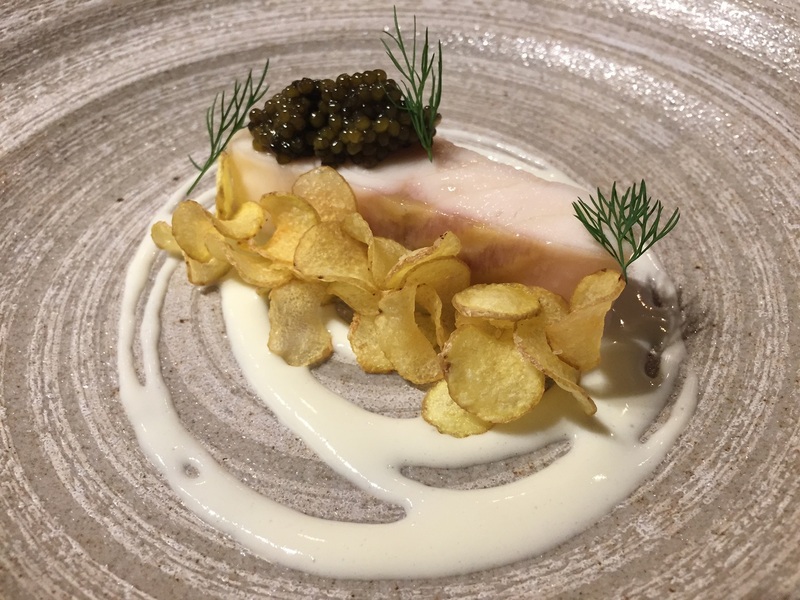 A textural counterpoint is thoughtfully offered in the form of tiny hand-cut potato chips, fried, I imagine, in some kind of animal fat to add depth of flavor. Mixed greens tend to be large and irregularly shaped, so conveying say, a spinach leaf, into your mouth often results in smothering your lips or their surrounding epidermis with salad dressing - a thoroughly unpleasant sensation requiring a napkin wipe. Lots of people like ordering salad because it happens that raw vegetables are deceptively filling. For more info on this phenomenon watch the vegan-forward documentary Forks Over Knives. However, given that you aren't ordering salad as a main, and that you're super hungry, oftentimes you'll devour the salad only to realize you don't have any room left for the main! It's pretty easy to take the same greens, toss them in a bowl, toss in some dressing, and toss the bowl to mix it up. If the dressing is white, you call it a Caesar, if it contains soy, you call it Asian. Maybe throw a boiled egg in there, maybe some tomatoes, some cheese, or some tangerine slices; the overall character of your dish won't really change. After a bite I'll understand the dressing, after two the greens, and three the condiments. Bo-ring! The size of the largest leaf in this course is certainly smaller than the diameter of your mouth (or at least my mouth). No mess. 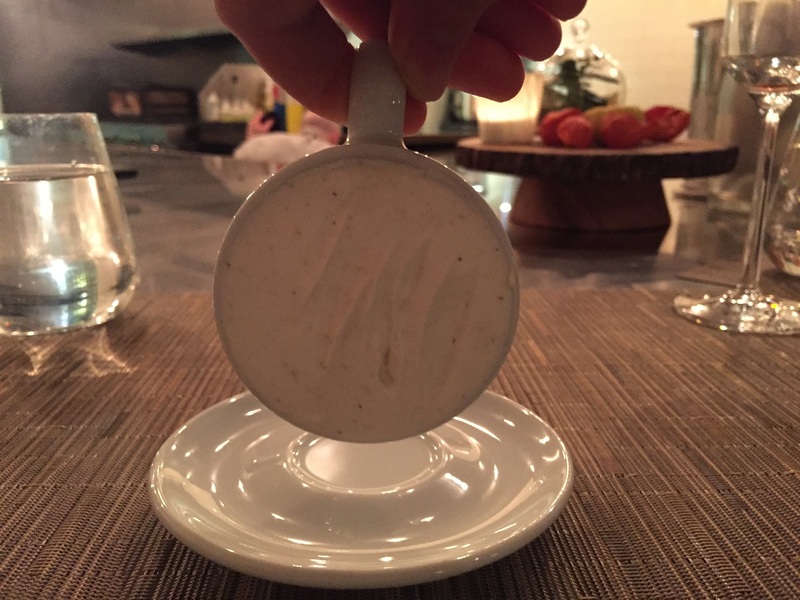 The perfect size for a single course in a long tasting menu. Who would ever think to fry a salad? Bicklehaupt does it lightly, perhaps with a touch of nutritional yeast, so that the veggies become brittle, crisp, but not hard. Contrast this with the crisp-but-flabby veggies in most salads. We have here a whole host of uncommon ingredients: brassica, white kohlrabi, caramelized onions, microkale, dehydrated Brussels sprouts... each of them lending their own unique flavor, intensified by the frying. 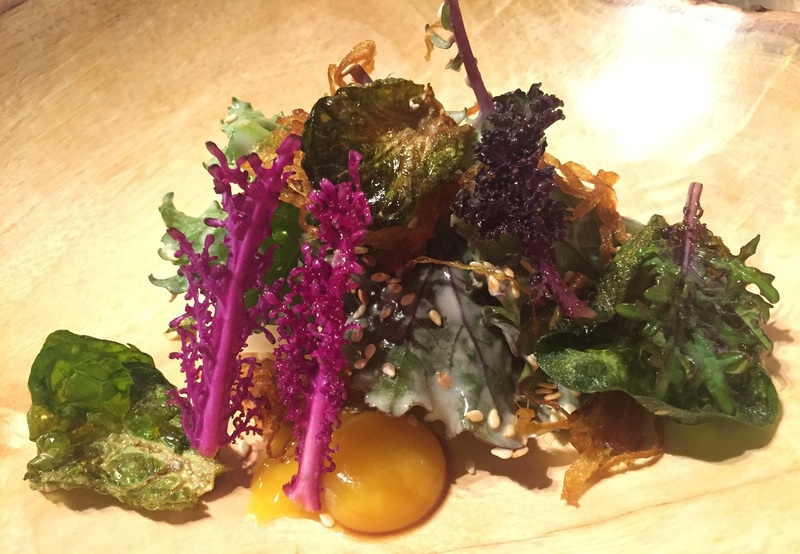 While the whey dressing was largely passable, the quail egg yolk doused in barrel-aged soy sauce was a phenomenal contrast to the dish's milder vegetal flavors and brittle textures. Think of quail yolk as a concentrated chicken yolk: smaller, more intensely yolky. A miniature, colorful, petrified forest. Imported from New Zealand and cooked on a griddle; served with coal-charred eggplant purée and baked black lentils with some peppery powdered nasturtium leaf. 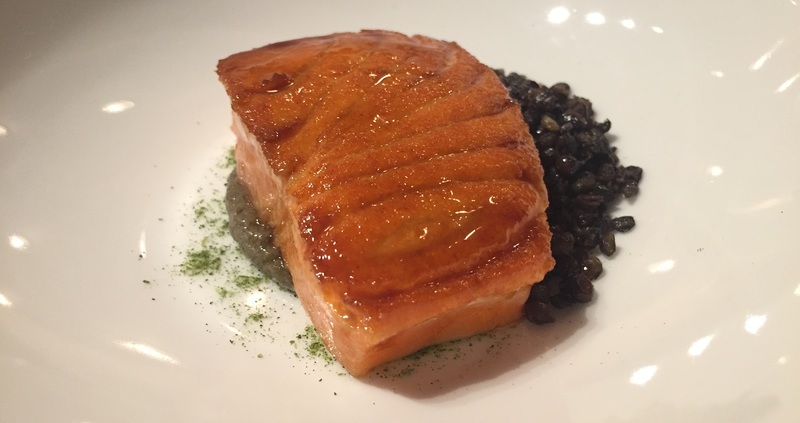 Admittedly and somewhat shamefully, I haven't paid much attention to the salmon here in the Pacific Northwest, some of the best in the country, to truly understand the culinary merits of each type. Based on preliminary tests, Chinook salmon is my favorite because it's soft and buttery relative to the tougher Coho. Sockeye seems similar to Chinook in texture but has more flavorful flesh; the other types I have yet to encounter. Regardless, there were no ostensible flaws to be found in this salmon. Although the scales have been removed, griddling the flesh still made it nice and crispy, the brushed marinade lending a mild but complex sweetness. The meat was - no surprise - soft and buttery. The black lentils were the most interesting. Typically stewed or boiled, lentils are commonly used as a warming, tender, and filling component, their singular texture a result of high starch and protein concentrations. Turns out when properly baked, they take on a satisfying crunch and release more of their earthy flavor. Good with the eggplant - inherently earthy, slightly sweet - but moreso for its textural contrast as a purée. A course well ideated and executed, yet... Lacking in heart, perhaps? I try to be descriptive so you can taste it too, but sometimes being romantic is necessary for you to get the full idea. Because you have its breast, jus, tongue, and skin all in a single dish. The first two are obvious, the latter two cleverly camouflaged amidst the rubble. 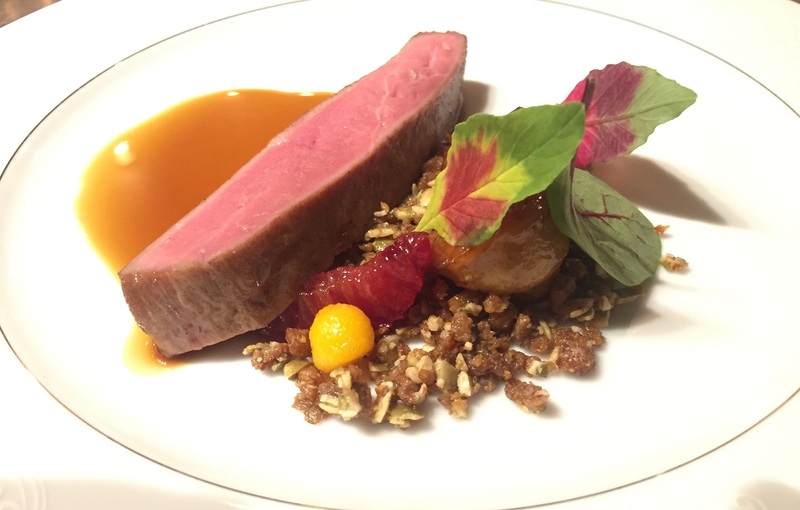 Preparing and presenting the main ingredient in a variety of ways, in a single course, is a habitual tour de force for tasting menu restaurants. On one hand this practice is a testament to the chef's skill, on the other a few different ways for the diner to be delighted. 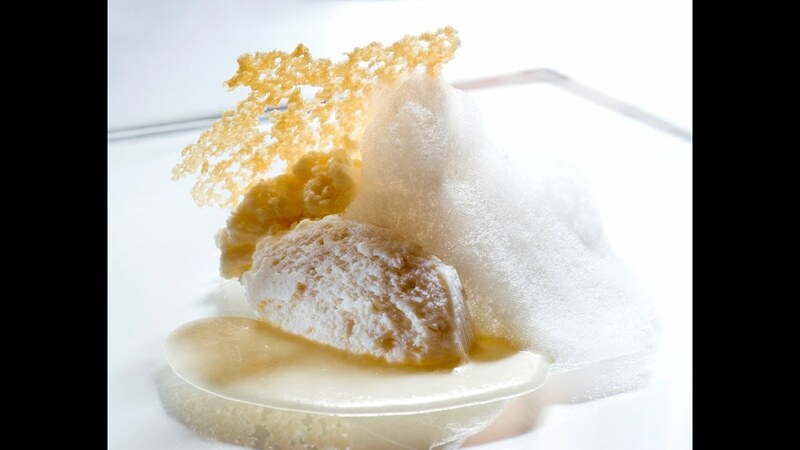 Witness Massimo Bottura's "5 Ages of Parmesan" and tremble. Duck is especially versatile. Try ordering a Peking Duck at a somewhat genuine Chinese restaurant and they'll cut it into nice bite-sized chunks, which you can dip into that tremendously complex and tremendously delicious thick black fermented wheat sauce with a pair of chopsticks. If they really know what they're doing, the skin will be super crispy from the roasting, and you should dunk it, as you would a tortilla chip, into the sugar bowl they give you - if they really know what they're doing - and have a gustatory epiphany. This is arguably an example of duck done two ways: the breast and the skin. 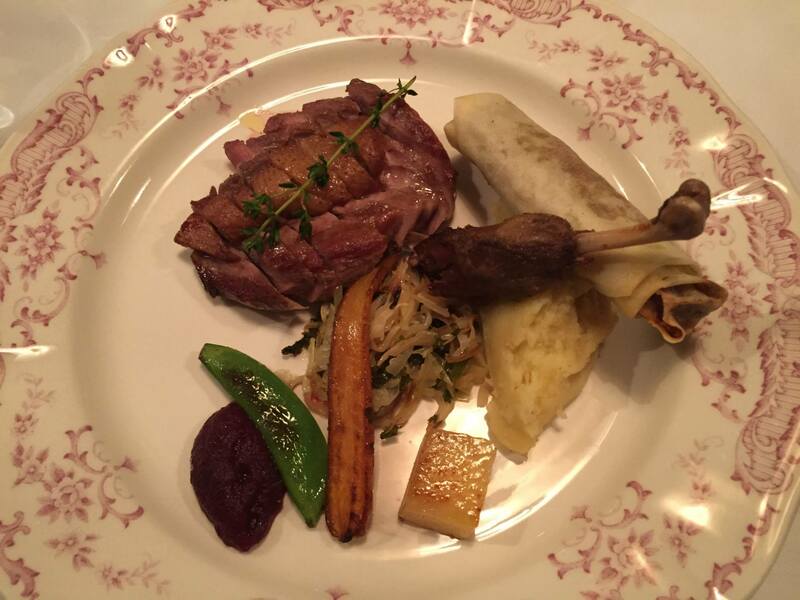 In Reykjavik's Fridrik V I had broiled duck breast, roasted duck thigh, and duck in a spring roll - in a course. The "rubble" is a bit more clever. You see halved pepitas (pumpkin seeds). Those leaves are a large cultivar of sorrel trademarked as Hearts on Fire, replete with a sour citrus kick. An actual citrus, the blood orange, glistens like a gemstone atop the crumble - deep ruby to be exact. Blood oranges are sweeter than regular oranges but also more bitter. That bright orange sphere? Yes, turns out we have pumpkin two ways too. Finally, the thick stalk of a matsutake mushroom lies underneath the sorrel, perhaps a play on the fungus's natural growth pattern (under trees). Matsutake tastes earthy and umami like most mushrooms but has an interesting firm and fibrous texture. Overall, pretty good for such a chaotic course. "Wa" - Japanese; "gyu" - cattle. Let it be known: I'm not particularly fond of steakhouses. One of my favorite things to do is listen to people discuss and recommend steakhouses. Jamie: "No, El Gaucho, it has a better sear." Camille: "I like John Howie. They really know how to age their beef." Biram: "Say what you want, Peter Luger is and always will be bar none the best." While the steakhouse has a distinct history and place in American culture, it is a dinosaur of an institution dedicated to excess and machismo. Dark rooms, expensive furnishing, cigars, whiskey, prime ribs, baked potatoes stuffed with cheese and sour cream, crab cakes... The cost is as high as the saturated fat in virtually every dish, and the return (value/cost ratio) is almost certainly low. As far as beef is concerned, I much prefer the more democratic art of barbecue. Regardless, beef does merit discussion - a lot of discussion - so pay attention. Marbling, a term named after the layered metamorphic rock, refers to the characteristics of a cow's intramuscular fat. The more complex and maze-like the fat, the higher its marbling grade. The USDA uses the terms Select, Choice, and Prime to refer to different beef qualities, and you'll frequently see USDA Prime, the most marbled American cattle, as a steak choice at many restaurants. The Japanese, ever the connoisseurs, scoff at our boorishness with their own, more complex grading scale with two different metrics - one of which is further broken down into three different components, the lowest of which determines the highest possible score for the overall metric. Confused yet? So even if the muscle gets a 5 and the texture gets a 5, if the fat gets a 4, the highest earnable score would be a 4. This score, called the Beef Marbling Standard (BMS), contains an alternate delineation from 1-12 with 12 being the highest; any cut with a BMS between 8 and 12 will be graded a 5, with A5 being the highest quality. Find out how USDA cuts compare here; for more on wagyu grading, see this site. This is a marbling comparison between USDA Prime and A5 Wagyu. You can guess which is which. 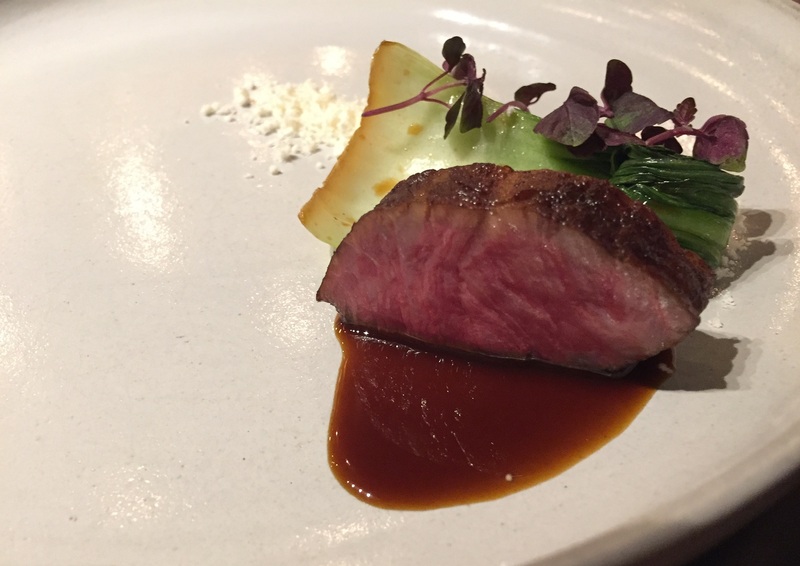 It happens that Chef Bicklehaupt has flown in some A5 from Miyazaki prefecture cattle and seared it thrice on a yakitori grill, rendering all of its labyrinthine fat into the surrounding muscle. You note butter and a mild fruitiness as it trickles onto your taste buds. As you chew, you taste more of the fat's flavor than the normal beefiness of steak, indicating that this cow has transcended its earthly origins, due in no small part to its constant massaging and beer-and-sake-tinged diet. You can slice this into five or six pieces and cleanse your palate with the crisp baby bok choy in between bites; a darkly sweet umeboshi sauce mixed with the more savory beef jus aids your appreciation of the decadence. But, even though I understand what the hype is about, I still don't feel it. The red cabbage microgreens and bone marrow crumble are more for decoration than anything else, and if it were up to me, I would've replaced these with a medley of soft fruits such as roasted pear. When I saw a large shank of cured ham sitting on the back counter, I immediately thought we'd be eating the famed jamón ibérico, but it turned out to be something even better. I thought these were pork rinds. Nope: aerated flax crisp held together by tapioca starch. Sprinkled with flax seeds and dusted with powdered kale. 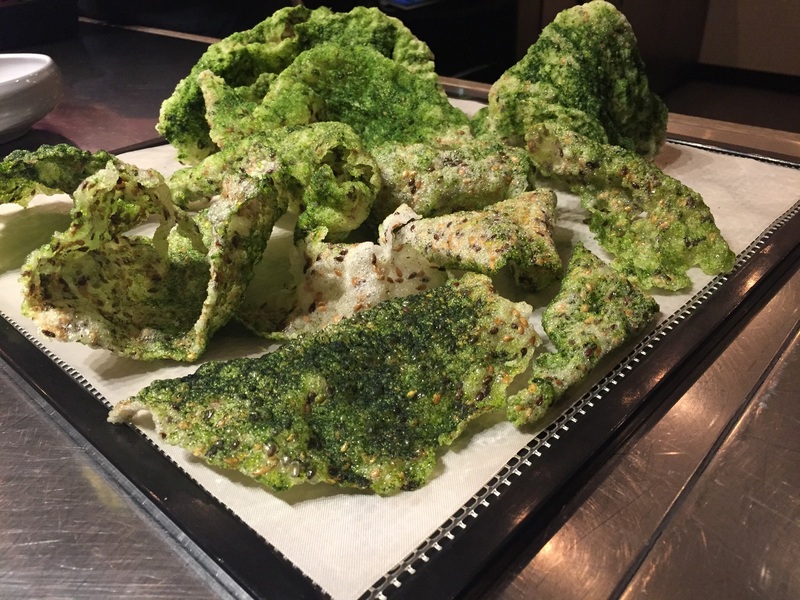 Before you lambast me for what seems a huge oversight, understand that humongous pork rinds are served as a snack at another amazing Chicago institution, The Aviary. That place should probably get its own post later. Twice wronged, pleasantly surprised, I popped a slice of the pig in my mouth: smoky, beefy, porky, meaty, fatty, jerky, chewy, tender, intense. Yes, all of those things in a bite, and even some sweetness at the very end. This stuff was the bomb. All to be subsumed by a supremely rich and softly creamy cow's milk cheese made in house. Palate cleansers come in all forms and flavors - the gari (ginger) of sushi, sour pickles for sandwiches, polenta for chocolate tastings - and for this cured pork, this cheese was as close to a reset button as you can get. My brother Otr had a different occupation and nature... He came home late and ate alone with his eyes shut, because he could not stand seeing his food diminish. 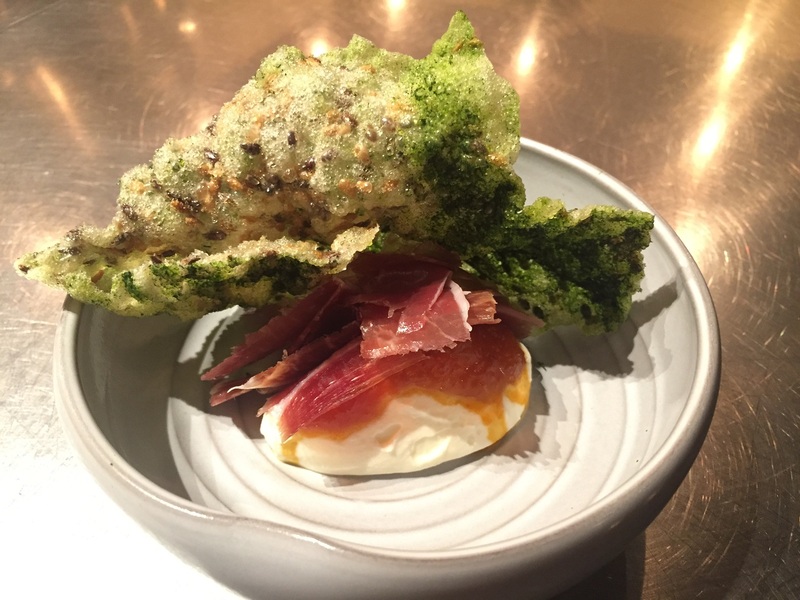 Even though I was able to sear the qualia of the mangalica time and time again into my memory, watching it physically disappear from my plate was a solemn affair. A sweet-and-sour sea buckthorn jam aided its vanishing act. Intended as part palate cleanse, part prelude to dessert. 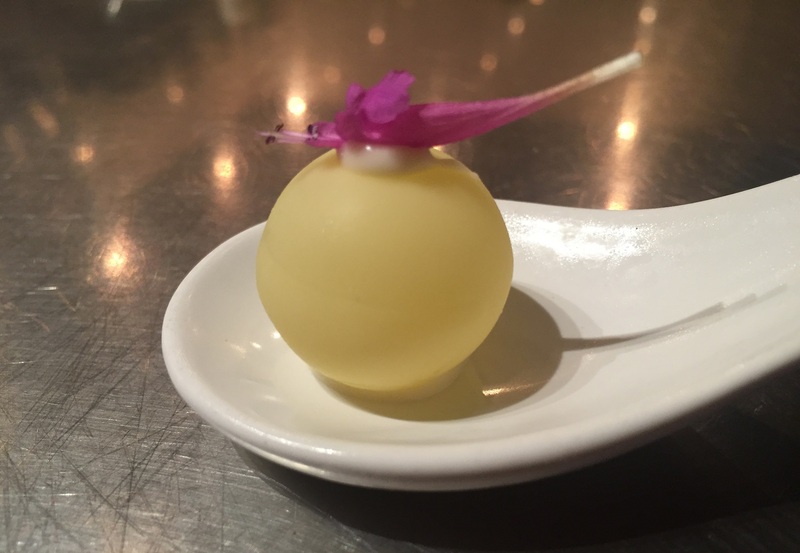 As you've probably guessed, it is some kind of liquid encased in a sphere of white chocolate. A cream of honey was used to hold it together. When the guy to my right bit in, he lurched forward in his seat, shocked by the intensity of what would be revealed as kabosu juice, a tart cousin of the citrus yuzu. I categorize this type of sphere as a "cascade" more than a "burst" because gravity pulls the shattered liquid downwards onto the tongue, as opposed to an omnidirectional explosion caused by a high-pressure breach of surface tension. If you ever have the opportunity to try a "burst" type sphere, cherish it. Shockingly, delightfully, that elegant magenta flower on top tasted exactly like Dubble Bubble bubble gum. "Bubblegum hyssop" or Agastache cana - your pick. Turns out the stuff repels mosquitoes too. 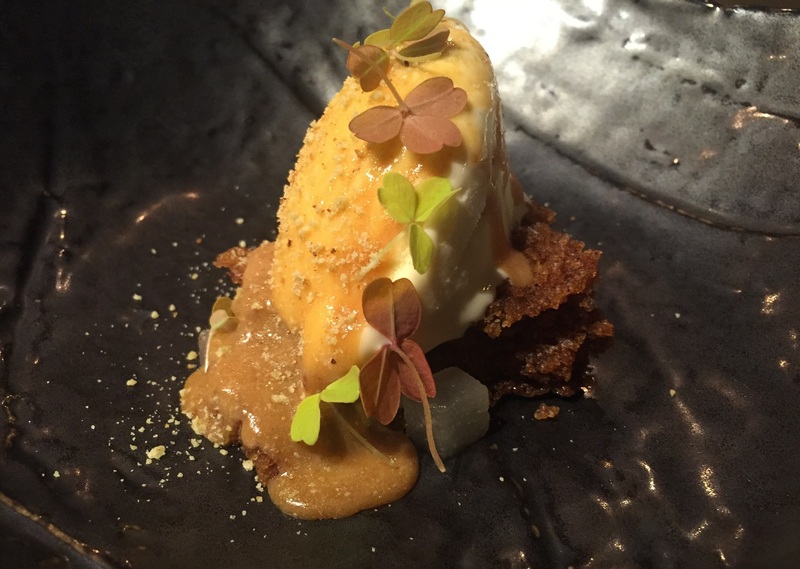 Some of you may recall that I wrote about a(n eerily) similar course at Alinea. Realize that some cook at Alinea spent perhaps an hour dusting that course with saffron to make it look like a satsuma, and that it was used in creative conjunction with its serving medium - neither of which was done here - so for you nitpickers who needed it, some evidence for why Alinea has one more *. But I did prefer this one. Aloe vera has been extremely popular in health circles for decades because it's anti-inflammatory and contains decent antioxidant levels; in fact, I personally like bandages containing aloe vera but cannot attest to cuts healing any faster. Maybe I'm just conning myself that it's better because I spent more money on it than a regular Band-Aid. Aloe vera is also found in the drink ALO, which I've seen some of you drinking before and can attest is quite tasty. Still, you don't taste any of its aloe because it's flavored with cane sugar, honey, and grape extract. Now, if you've actually bought an aloe vera stalk from your local health food store and tried to eat it, you'd notice how hard it is to get at the pulp. The skin is very bitter and unpleasant; the pulp is relatively flavorless but sheens with a slimy, viscous liquid. It turns out that if you infuse aloe vera extract in gelato, a light floral flavor is invoked, which pairs well with the dense milkiness of the ice cream. The miso and caramel are clear counterpoints, the former adding the umami of fermented soy and the latter balancing it out with an equally complex sweetness. The oaxalic acid present in the clovers adds a tiny bit o' sourness in a leafy texture, just a small but sharp hit. A tiny square of ya pear adds a tinge of artistic flair. Now the galangal cake, while interesting, was definitely too strong. Galangal looks almost exactly like ginger and has a sharp pine flavor. I think this one was baked with too much salt - itself a problem, but it also messed up the flavor of the miso glaze - double whammy. Coffee is a popular food subculture which I am not privy to, even after having lived in Seattle for nearly two years. It's also a common respite at the end of a lengthy meal, dark, bitter, warms the stomach, warms the soul. Yet, this dish is no coffee. It's just the cream, in the form of a light and airy mousse. Some diners tried to drink it but realized there was no liquid. Originally a Ferran Adria recipe, this Pavlovian trick was given new life in the form of a special blend by the highly acclaimed Chicago roaster Sparrow and a dash of aromatic cardamom. The flavor was uniform, a mild and sweet espresso, slightly nutty with some vanilla. So we're still interested, hopefully, in answering: how are these two able to accomplish an entire kitchen's labor by themselves? Any cook can tell you what mise en place means - it's the arrangement of things in their proper order (put in place in French). A good cook can just reach for a particular tool and know that it's there, much like touch typists know where their keys are without having to look at them. Anger and frustration is likely to result if someone decides to reorganize that cook's area; I like it when my parents come over and cook, but I don't like having to reorganize the kitchen after they leave. 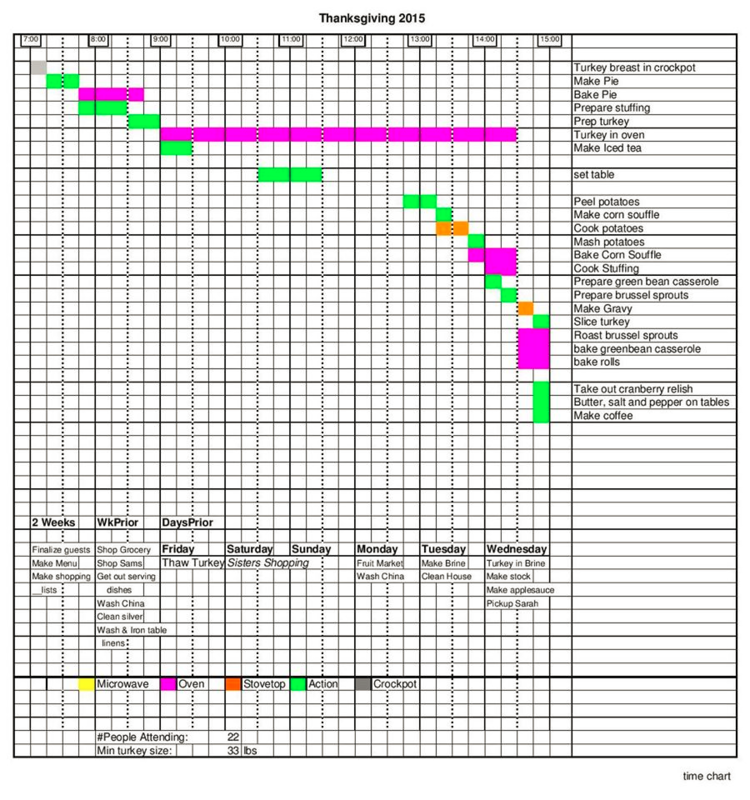 Any operations analyst can tell you what a Gantt chart is. It's basically a method of visually describing a project by breaking it down into its constituent processes and the time they take to run. If you haven't seen one before, it's actually pretty cool. That chart was created by a woman planning an ambitious Thanksgiving dinner. She doesn't have to think very much if she just refers to the chart and does everything according to schedule. Now, a meal like the one I described above takes a lot of preparation. A lot of preparation. I believe Bicklehaupt is a savant: intuitively creating a Gantt chart in his mind several times more complex than the Thanksgiving one, and understanding exactly where his myriad tools are in his extremely meticulous mise en place. It's true - if there's only one cook in the kitchen, there's no one there to mess with his setup. Changing recipes every few weeks, working with different sets of ingredients based on what's fresh, serving two meals a night five nights a week - this is prodigious. It's worth mentioning that 42 Grams is not pretentious at all. Immensely friendly, the atmosphere is like that of a family gathering - except the person cooking is a cooking genius. I've also never been to a (Quality and Variety)-type restaurant with such noticeably regular clientele; the two folks sitting to my right were on their fourth visit, and a couple other diners were on their second or third. Furthermore, diners don't need to be well-versed in culinary patois in order to enjoy their food. Alexa, who has remarkably sharp taste, explains each course after she serves it: what ingredients were used, how best to savor each dish, and from time to time why those particular ingredients were chosen. My friends recommended I try it, and I will now echo their sentiment to all of you if you're ever in Chicago. Of course MacDougall's experiment was flawed; the body can lose weight posthumously for any number of reasons. If the soul exists - if your soul exists - it will not be weighed by its physical mass on a scale, but by the character of your thoughts, values, and actions. It's nice to think so at least.